The only thing better than cool iPhone apps? Free iPhone apps. Of course, iTunes' App Store doesn't do a particularly good job highlighting the freebies, particularly those apps that used to cost a few bucks but are now permanently, or temporarily, gratis. 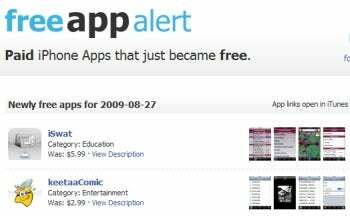 Enter FreeAppAlert, a Web site that catalogs all newly free iPhone apps. The site (a must-bookmark for iPhone and iPod Touch owners) lists an updated-daily collection of each newly free app along with its former price tag and one or more thumbnail screenshots. When you mouse over a thumbnail, the full-size version of the screenshot appears immediately--a nice alternative to clicking all the way through to the App Store just to see what an app looks like. Likewise, you can show or hide an application's description by clicking View Description; no need to leave the page. FreeAppAlert also has a Twitter feed. You can also become a fan on Facebook and subscribe to an RSS feed.